Here's something you will want in your closet: clothes that never stain. Hell, they never even get wet. 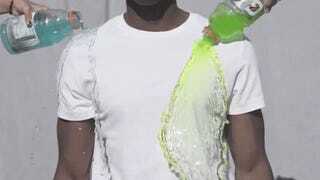 This Silic T-shirt basically cleans itself with hydrophobic nanotechnology. That means no matter what you spill on it, it'll never damage the shirt. The T-shirt, called the Silic and is a Kickstarter project that has already cleared its funding goal, is ultra soft and can last over 80 washes. I want all my clothes to be like this. You can get your shirt here.